Renovate to Sell that House – Bathrooms Part Two! So last time we went through the functional stuff that will make a bathroom work with an emphasis on the planning stage of a bathroom re-design. Not the most exciting thing....but it has to be done to ensure that the renovation of your bathroom goes according to plan and on budget as well as look amazing when it’s done. If you missed bathrooms part one click here for the information that you will need before starting with this week’s blog. But now it’s down to the more fun things to do. It’s time to choose the lighting, the tiles for the floor and walls, taps and accessories, cabinetry and the truly decorative elements to dress that bathroom to sell that house! Don’t ever be tempted to use conventional light fittings in a bathroom and work must be carried out by a qualified electrician! European legislation dictates that you must use appropriate luminaires and the previous blog will tell you what is appropriate for what area. Check the IP rating on that light. IP??? What on earth is that you say? IP ratings tell you how close the item can be to water or near humidity. The first number relates to its protection from insects, dust and other foreign solid particles/objects. The second number relates to its protection from liquid/moisture. The HIGHER the number the better the protection. When you buy light fittings for the bathroom there is always a number on the box/description so ensure it can be fitted in the zone/area you want. Check with the electrician it’s always best. 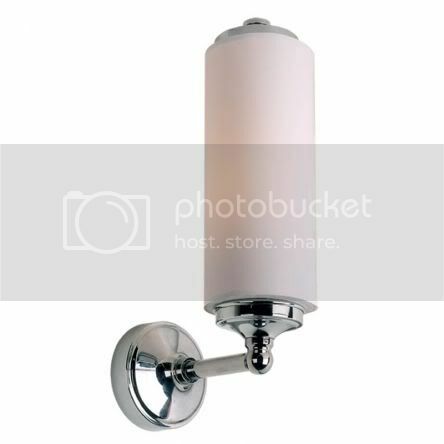 LB4009 Classic opal tubular wall light, max. wattage 40W (S.E.S. bulb) (recommended for use in Zone 3 applications. Taken from Lefroy Brooks website. I can suggest some great bathroom fittings here for traditional styles go to Lefroy Brooks, not the most diverse range but solid, elegant and very well made. Try also CPHart for good quality lighting, ranging from wall lights to ceiling lights and donwlighters. You can find countless online shops these days, but again remember that you need to buy according to the zones, refer yourself back to the diagram in part 1 of our bathroom series. The choice is more than vast, it’s infinite! SO before you head out and get a headache with the myriad choices, think about this. There are floor tiles and there are wall tiles. They are NOT the same. I am assuming you are choosing ceramic tiles here. Floor tiles are thicker than wall tiles – it’s a question of weight and a question of usage. Thinner wall tiles are hung vertically so less weight is better and since it has relatively less wear it makes sense. Ensure you read the information on the specification – it will stipulate for heavy wear, medium or light. Marble is a choice material but does need maintenance and frankly unless you are selling a top end property for a re-fresh it would really be over the top. 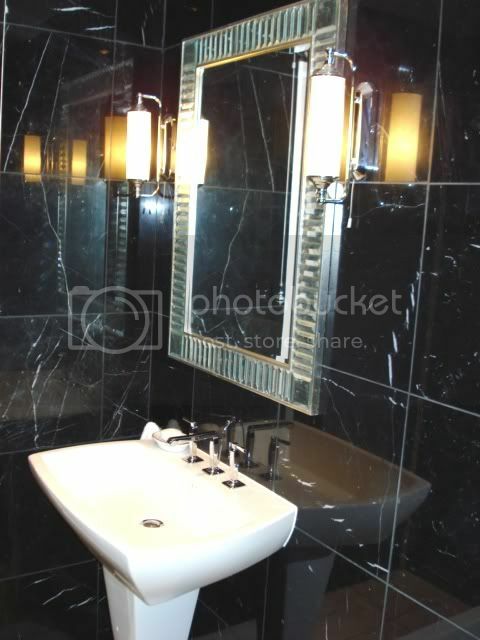 Although this “Waow” bathroom below shows you what can be achieved with marble – Deco bathroom by Fonte dei Marmi. People always forget about this. I always specify grout colour for my contractors, it’s really important. I can bet you anything that your contractor will call you just before he has to lay the tiles and ask about this. So before answering “oh just go for white” think carefully about it when you buy the tiles. As a general rule, light coloured grout for light coloured tiles and dark for darker ones. And remember you need to seal the grout if it gets a lot of use, otherwise it will get dirty, especially the lighter ones. Often tile manufacturers will suggest grout colours to suit their tile styles, so go ahead and have a look at the displays carefully. When you have decided on the tiles for the floor and the walls, then you need to measure to measure up unless you want to leave this to the contractor. But in essence it’s very easy: measure you width by your length (floor or wall) so say 2m x 2m = 4m² (square metres). Divide 1 by the measurement of the tiles you have chosen, so say you have chosen tiles that measure 200x250mm (1/.20/.25 = 20) giving you 20 tiles per metre square. Then time the area, in our case 4m² by the tiles per metre in our case 20 = 80- tiles required. I usually add 10% for any awkward cuts/breakages but also if you ever have to replace a tile, you will have some spare. But shops often state how many tiles are required for so many square metres, so it’s really easy. Often the advice is to go for small tiles for small rooms and bigger ones for larger rooms. I don’t agree! 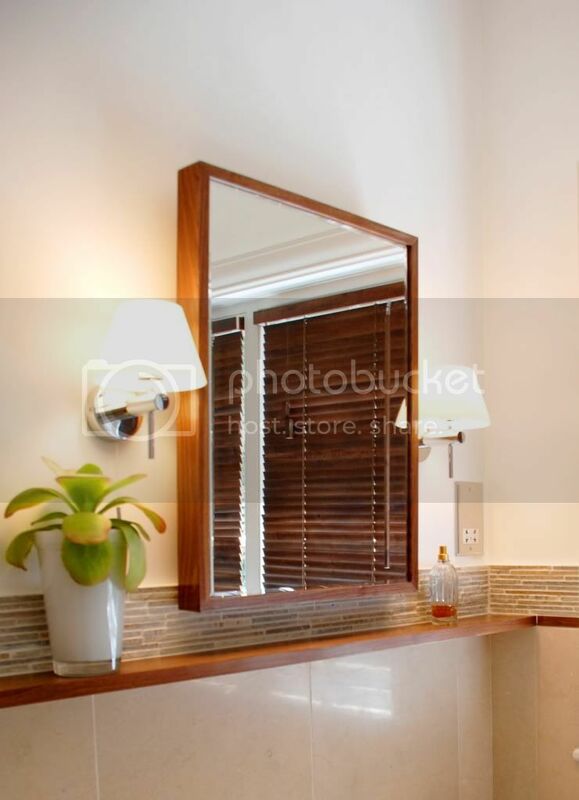 It looks so nasty and finicky to have small tiles in a small bathroom – it emphasises the smallness. Go for larger tiles – less joints therefore less detail to look at on the floor and walls. Larger tiles also visually suggest a larger room – important if you want to sell. In general I never buy small tiles – unless it is mosaics. I also go for the same wall tile sizes, it unites a bathroom and makes it look seamless, especially if it is on the small side. But there are always exceptions – I particularly like this look again from the Fonte dei Marmi chaps. 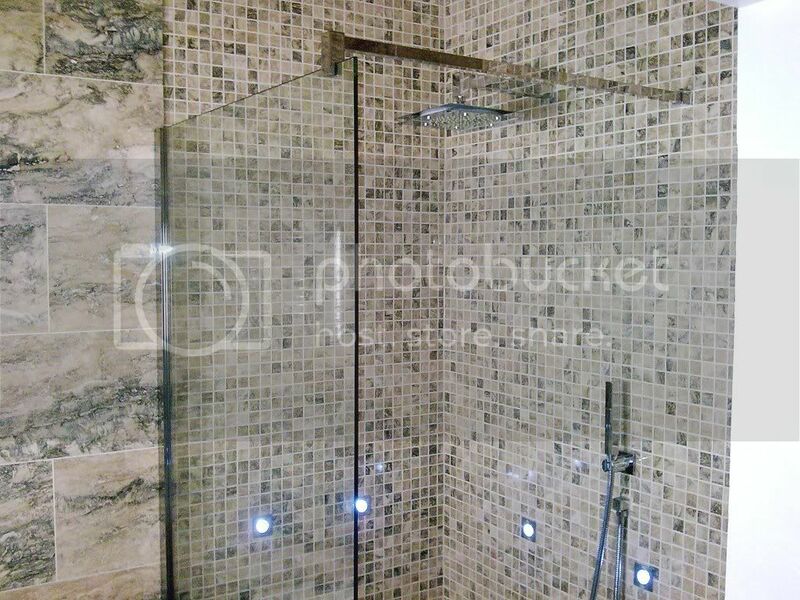 The difference here is that it is a good way of accentuating a different area, in this case the shower area. They have kept the elegance by using the same tiles and colour, just enhancing it with different sized tiles gives it texture. Next week we go through the various tile materials - slate, ceramic, stone etc and take you through the good and the bad points of each. We will also discuss colour! We will also discuss fixtures and fittings, sinks and toilets, and the decorative bits you can add when that all important buyer comes round.